It’s almost Spring, which means March Madness of course, but it also means another kind of March madness of sorts – biblical movies! With Lent, Mardi Gras, Easter and other significant Christian holidays coming up, we’ll start to see all the familiar religious epics again. A bunch of them will be re-released on Blu-ray. I love these pictures, even though most of them are not very good. And I’m not anything remotely close to religious; hell, I’m not even baptized, but I do love my biblical epics. First up is King of Kings starring Jeffrey Hunter as Jesus. As I mentioned, I love these movies, but I particularly love Samuel Bronston films. Mr. Bronston was one of the great independent international producers working in Europe but with Hollywood talent. Unfortunately, he fell into bankruptcy and eventually financial fraud. But before that, he produced two of my favourite spectacle films – El Cid and Fall of the Roman Empire. 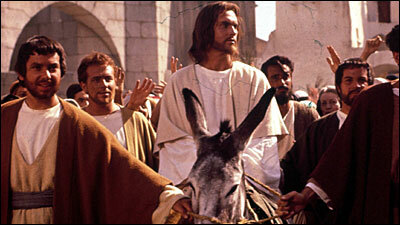 However, the film that helped birth both of those pictures was the success of 1961’s King of Kings. Unfortunately, it’s not Bronston’s finest hour (or should I say three hours), but it contains all the corny and demonstrative pomp and circumstance common to this brand of historical epic. It has widescreen expansive shots featuring thousands of extras populating the huge canvas, sharp and colourful 70mm photography that pops so beautifully on Blu-ray and a rousing inspiring score by Bronston’s preferred composer Miklós Rózsa. The opening 20 minutes or so is terrific, a lengthy bit of exposition narrated by Orson Welles describing the historical background of Rome and its relationship to Jerusalem and the Holy Land. Then the film settles down into the expected scenes starting with Jesus' birth in the stable, his early adulthood and 40-day/40-night fast in the desert, his Baptism, his miracles, his entry into Jerusalem, his incarceration, his trial, and his eventual crucifixion and ressurection. Unfortunately, Bronston and director Nicholas Ray (Rebel Without a Cause) seem utterly frightful of painting Jesus in any other light than complete deification, so much so that Hunter rarely has to act or express any emotions. He floats around the movie impervious to any conflict from his enemies. This is in stark contrast to say, Willem Dafoe’s Jesus in The Last Temptation of Christ. Most of the life in the film comes from the people around Jesus who are affected by his presence, particularly the Apostle Judas, Barabbas and John the Baptist. The Romans are given equal, if not more, screen time then Jesus and his followers. It results in the usual 'Roman-speak' and the political jabbing we saw in every Roman film before it. Oddly, Barabbas, who I believe does little in the actual story of Jesus, is expanded into a significant character who organized the Jews against the Romans. It’s perhaps the only resonant aspect of the story, which comments upon imperialism and the Western occupation of other 'third world' countries. Despite the success of the film, King of Kings is Bronston’s weakest and least rousing spectacle film, an adequate re-creation of the bible for puritan interests only. King of Kings is available Blu-ray from Warner Home Entertainment.